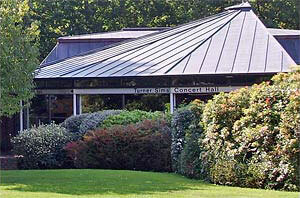 Opening in 1974, Turner Sims is acknowledged as one of the finest music venues in the country. Hosting over 60 concerts a year, it attracts internationally renowned performers including guitarist John Williams. Situated on Southampton University’s Highfield Campus, the venue is also used by local groups and societies for concerts and rehearsals. Regular train services from London to Bournemouth stop at both Southampton Airport Parkway and Southampton Central stations. Services from Portsmouth to the West of England stop at Southampton Central station. The Turner Sims is a short ride by taxi or bus ride from both Parkway and Central stations. The Turner Sims is served by both Uni-link and First Southampton. Take Junction 14 of the M3 and follow signs for the A33 into Bassett Avenue towards Southampton. The University is signposted on your left at the interchange with the A35 (Burgess Road). Take Junction 5 (Southampton Airport) of the M27 and follow the A335 (Stoneham Way) towards Southampton and the A35 (Burgess Road) towards the University. Free parking is available in all the University car parks after 6 pm and at weekends. There are accessible parking spaces near to Turner Sims. There are spaces for wheelchair users in the Concert Hall and designated car parking spaces nearby. There is also good access to the box office, bar and toilet facilities, and an induction loop for people with impaired hearing.